According to Jay’s testimony, Adnan strangled Hae and then solicited the help of Jay to dispose of the body. The police wondered why Jay, an acquaintance of Adnan, would ever go along with that. Jay stated that he initially refused. But Adnan threatened to go to the cops about Jay’s pot dealings. Wanting to avoid that, Jay becomes an accessory to murder. To me, this makes no sense at all. I could understand why Jay might prefer burying the body to having to deal with the police over some (relatively minor) marijuana, but the latter scenario would never happen. Adnan simply does not have a credible threat here. If Adnan goes to the police to turn in Jay, Jay can easily plead out of the crime by handing them Adnan. Jay has all the leverage here. Adnan has none. Did Jay not realize this? I can’t imagine that is true. Jay is supposed to be street-smart. He might not understand the difference between Nash equilibrium and subgame perfect equilibrium, but he certainly should understand the difference between a credible threat and an incredible threat. Would Jay not be willing to snitch on Adnan if Adnan turned him in? If so, then Adnan would not be deterred from pointing the police to Jay, and so maybe Jay would go along with it. But I can’t imagine this is true either. First, it would require Jay to not want to rat on the guy who just ratted on him, even though it would likely mean that Jay’s charges would be dropped. Second, we in fact know Jay was willing to snitch on Adnan—because he did! This leads me to conclude that Jay’s lying. I’m not sure why or what it means, but I think it’s important. TL;DR: Jay’s story is not subgame perfect. Why Are the NBA Finals on Sundays and NHL Finals on Saturdays? A simple answer: iterated elimination of strictly dominated strategies. The NBA and NHL have an unfortunate scheduling issue: their finals take place at roughly the same time, and having games scheduled at the same time would hurt both of their ratings. But this isn’t a simple coordination game. Everyone wants to avoid playing on Fridays, which is the worst night for ratings. This forces one series to play games on Sundays, Tuesdays, and Thursdays, with the other on Saturdays, Mondays, and Wednesdays. The first series is far more favorable for ratings and advertisements: it avoids the dreaded Friday ans Saturday nights entirely and also hits the coveted Thursday night slot. So who gets the good slot and why? Well, the NBA wins because of its popularity. Some sports fans will watch hockey or basketball no matter what, but a sizable share of the population would be willing to watch both. Sadly for the NHL, though, those general sports fans break heavily in favor of the NBA. This allows the NBA to choose its best choice and forces the NHL to be the follower. A more technical answer relies on iterated elimination of strictly dominated strategies. In my textbook, I have analogous example between a couple of nightclubs, ONE and TWO. Both need to decide whether to schedule a salsa or a disco theme. (This is like deciding whether to schedule games on Saturdays or Sundays.) More patrons prefer salsa to disco. However, ONE has an advantage in that it is closer to town, giving individuals a general preference for it. Thus, TWO really wants to avoid matching its choice with ONE. So TWO can still break even if it picks the same choice as ONE but needs to mismatch to make a profit. How should TWO decide what to do? Well, it should observe that ONE ought to pick salsa regardless of TWO’s choice—no matter what TWO picks, ONE always makes more by choosing salsa in response. Deducing that ONE will pick salsa, TWO can safely fall back on disco. In the NBA/NHL case, the NHL must recognize that the NBA knows it will draw uncommitted fans regardless of the NHL’s choice. This means that the NBA should pick Sunday regardless of what the NHL selects. In turn, the NHL can safely place hockey on Saturday. It’s not the perfect outcome, but it’s the best the NHL can do given the circumstances. Thursdays are the biggest day for ad sales because entertainment companies want to compete for leisure business (movies, theme parks, etc.) over the weekend. I used these names in the textbook not only because they represent Player ONE and Player TWO but also because Rochester (where I went to grad school) has a club called ONE. This led to an interesting conversation when the Graduate Student Association scheduled an open bar there. I was relatively new at the time and didn’t know much about the city. After hearing rumors about the vent, I asked a fellow grad student where it would be. “ONE,” she said. The last two lines repeated more times than I would like to admit. Can More Information Ever Hurt You? The answer would seem to be no. After all, if information is bad for you, you could always ignore it, continue living your life naively, and do better. Further, it is easy to write down games where a player’s payoff increases with the amount of information he has, and there are plenty of applications positively connecting information to welfare, like Condorcet jury theorem. In reality, the answer is yes. Unfortunately, you can’t always credible commit to ignoring that information. This can lead to other players not trusting you later on in an interaction, which ultimately leads to a lower payoff for you. Here’s an example. We begin by flipping a coin and covering it so that neither player observes which side is facing up. Player 1 then chooses whether to quit the game or continue. Quitting ends the game and gives 0 to both players. If he continues, player 2 chooses whether to call heads, tails, or pass. If she passes, both earn 1. If she calls heads or tails, player 2 earns 3 for making the correct call and -3 for making the incorrect call, while player 1 receive -1 regardless. Backward induction easily gives the solution: player 2 chooses pass, so player 1 chooses continue. Both earn 1. Now the solution is for player 2 to choose heads and player 1 to quit. Both earn 0! The case where the coin landed on tails is analogous. Player 2 now chooses tails and player 1 still quits. Both earn 0, meaning player 1 is worse off knowing the result of the coin flip. What’s going on here? The issue is credible commitment. 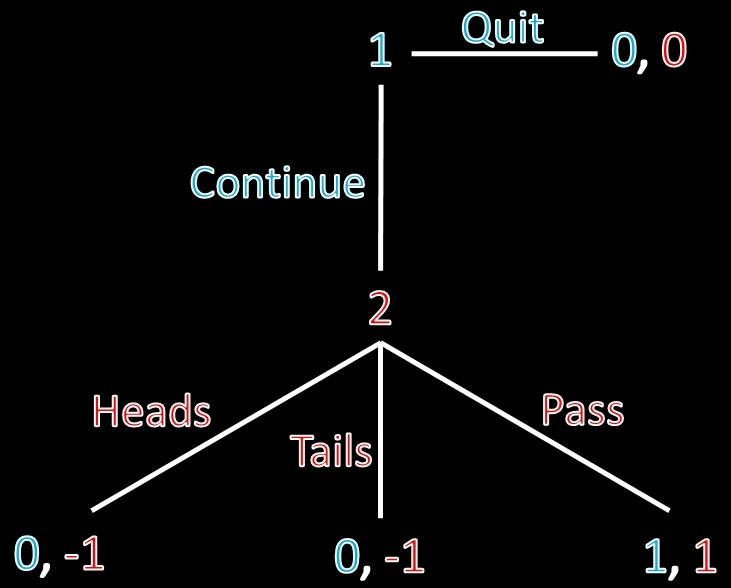 When player 2 does not know the result of the coin flip, she can credibly commit to passing; although heads or tails could provide a greater payoff, the pass option generates the higher utility in expectation. This credible commitment assuages player 1’s concern that player 2 will screw him over, so he continues even though he could guarantee himself a break even outcome by quitting. On the other hand, when player 2 knows the result of the coin flip, she cannot credibly commit to passing. Instead, she can’t help but pick the option (heads or tails) that gives her a payoff of 3. But this results in a commitment problem, wherein player 1 quits before player 2 picks an outcome that gives player 1 a payoff of -1. Both end up worse off because of it. Weird counterexamples like this prevent us from making sweeping claims about whether more information is inherently a good thing. I noted at the beginning that it is easy to write down games where payoffs increase for a player as his information increases. Most game theorists would probably agree that more information is usually better. But it does not appear that we can prove general claims about the relationship. 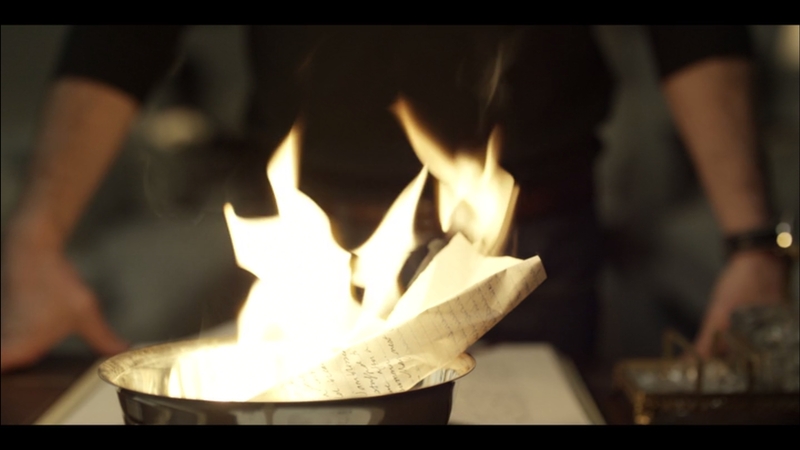 Game theorists often talk about “burning money” metaphorically, but this is as close to reality as it gets. 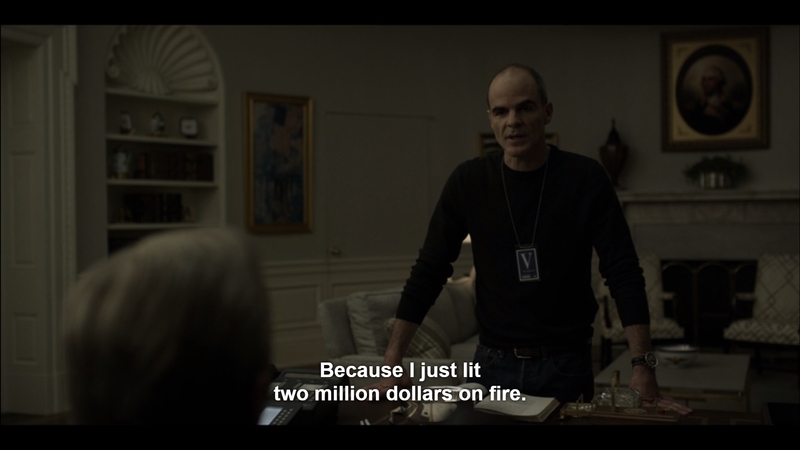 Doug Stamper wants President Frank Underwood to appoint him White House Chief of Staff. Frank is unsure whether Doug is a committed type or an uncommitted type. In the absence of any new information, Frank would be better off denying Doug the position, as it would give Doug the ability to feed sensitive information to Frank’s primary opponent. So Doug burns a scandalous journal entry that he could have sold for $2 million and notes that only a resolved type would be willing to forgo that gain. Frank hires him. 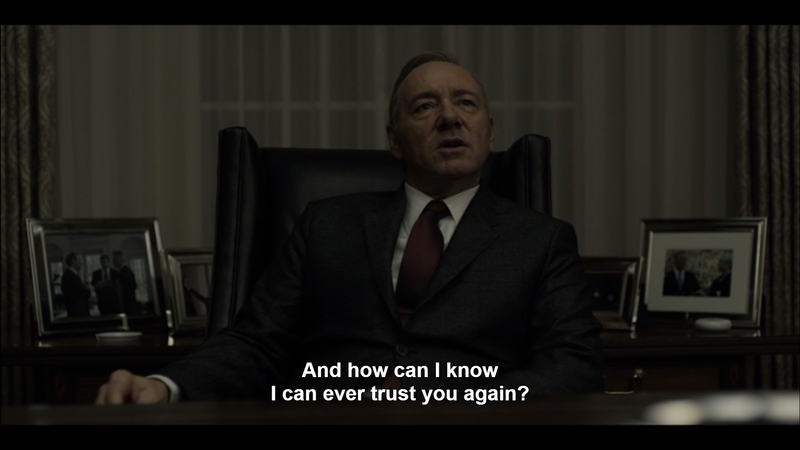 If you are wondering why political scientists like House of Cards so much, that’s why. Costly signaling at its finest. It seems that social media has lashed out at Pete Carroll for not giving the ball to Marshawn Lynch on second and goal with less than a minute to go. The idea is that Marshawn Lynch is #beastmode, an unstoppable force that would have assuredly scored and won Super Bowl XLIX. The problem is, the argument makes absolutely no sense from a game theoretical standpoint. The ability to succeed on any given play is a function of the offense’s play call and the defense’s play call. Call a run against a pass blitz with deep coverage, and the offense is in great shape. Run deep routes versus that same defense, though, and you are in trouble. Thus, once you strip everything down, play calling is nothing more than a very complex guessing game. The Seahawks want to guess the Patriots’ play call and pick the correct counter. Vice versa for the Patriots. The premise is that we each have a penny and simultaneously choose whether to reveal heads or tails. I win $1 from you if the coin faces match, while you win $1 from me if the coin faces mismatch. You should quickly work out that there is a single best way to play the game: both of us should reveal heads 50% of the time and tails 50% of the time. If any player chooses one side even slightly more often, the other could select the proper counter strategy and reap a profit. Randomizing at the 50/50 clip guarantees that your opponent cannot exploit you. In terms of football, you might think of you as the offense and me as the defense. You want to mismatch (i.e., call a run play while I am defending the pass) and I want to match (i.e., defend the pass while you call a pass). What is interesting is that this randomization principle neatly extends to more complicated situations involving hundreds of strategies and counterstrategies. Unless a single strategy is always best for you regardless of what the other side picks, optimal strategy selection requires you to randomize to prevent your opponent from exploiting you. What does this tell us about the Marshawn Lynch situation? Well, suppose it is so plainly obvious that Pete Carroll must call for a run. Bill Belichick, who many see as the god of the football strategy universe, would anticipate this. He would then call a play specifically designed to stop the run. By that I mean an all-out run blitz, with linebackers completely selling out and cornerbacks ignoring the receivers and going straight for the backfield. After all, they have nothing to lose—the receivers aren’t getting the ball because Lynch is assuredly running it. Of course, it doesn’t take much to see that this is also a ridiculous outcome. If the Patriots were to certainly sell out because the Seahawks were certainly handing the ball to Lynch, Pete Carroll would switch his strategy. Rather than run the ball, he would call for a pass and an easy touchdown. After all, a pass to a wide-open receiver is a much easier touchdown than hoping Marshawn Lynch can conquer 11 defenders. The again, Belichick would realize that the Seahawks were going to pass and not sell out on his run defense. But then Carroll would want to run again. So Belichick goes back to defending the run. But then Carroll would pass. And Belichick would call for pass coverage. And so forth. There is exactly one way to properly defend in this situation: randomize between covering a run and covering a pass. There is also exactly one way to properly attack in this situation: sometimes run the ball and sometimes pass it. This is the only way to keep your team from being exploited, regardless of whether you are on offense or defense. Okay, so we have established that the teams should be randomizing. What does that say about the outcome of Super Bowl XLIX? Well, clearly the play didn’t work out for the Seahawks. But to judge the play call, we can’t account for what happened. We can only account for what might happen in expectation. And in expectation, passing was optimal in this situation. If you aren’t convinced, imagine we all hopped into a time machine to second and goal with the knowledge of what happened. Would Pete Carroll call a run? Maybe. Would Bill Belichick sell out on the run? Maybe. But maybe not—Carroll might call a pass precisely because Belichick is anticipating him running the ball. We are back in the guessing game before. And as before, the only way to solve it is to randomize. That’s the magic of mixed strategy Nash equilibrium. Even if your opponent knows what you are about to do, there is nothing he or she can do to improve your score.